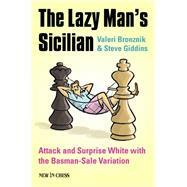 The Basman-Sale Variation is a relatively unexplored weapon for Black in the Sicilian Defence. After the perfectly normal moves 1.e4 c5, 2. Nf3 e6, 3. d4 cxd4 4. Nxd4 Black lashes out with 4…Bc5! English IM Michael Basman and Croatian IM Srdjan Sale were the pioneers of this cunning chess opening system. The advantages are clear: it is surprising, aggressive and easy to learn. Compared to the complexity of mainstream Sicilian variations it requires little theoretical preparation, while you don't run excessive risks. That is why The Lazy Man's Sicilian is ideal for club players who don't have much time to study opening theory (or are not too fond of hard work anyway). This easily accessible and up-to-date book offers everything you need to get started with the Basman-Sale Variation. In well-organized chapters it describes the history and underlying ideas of the variation and explains the pawn-structures, the strategies and the tactical themes. What's more, if you play the Basman-Sale system, there is plenty of room for your own creativity as well! Ukrainian International Master Valeri Bronznik lives and works in Germany. He has written a number of highly acclaimed books, such as ‘Techniques of Positional Play'. Steve Giddins is a FIDE Master and a former editor of British Chess Magazine. He's the author of several outstanding books and is well known for his clarity and no-nonsense advice.